Vogel Nest is a New York based design studio founded by Graphic Artists Kristin and Shannon Vogel. The name Vogel means bird in German, and Nest is an abode for birds; a place of rest, retreat or lodging. Like birds, these designers were born and raised in the same home, but have traveled all over the world. This has given them a worldly art direction, that is still inherently shaped by the place that they come from. Vogel Nest invites clients to join the Nest in creating professional, digital art for brands and publications worldwide. Planning a time sensitive trip can be an overwhelming task for new and inexperienced travelers. There is no guarantee that you will be able to see what you want when unexpected delays derail your schedule. Trying to reroute your itinerary can be a disturbance in itself, not to mention time wasted. But what if there was a way you could eliminate those issues in advance and have a stress free experience? 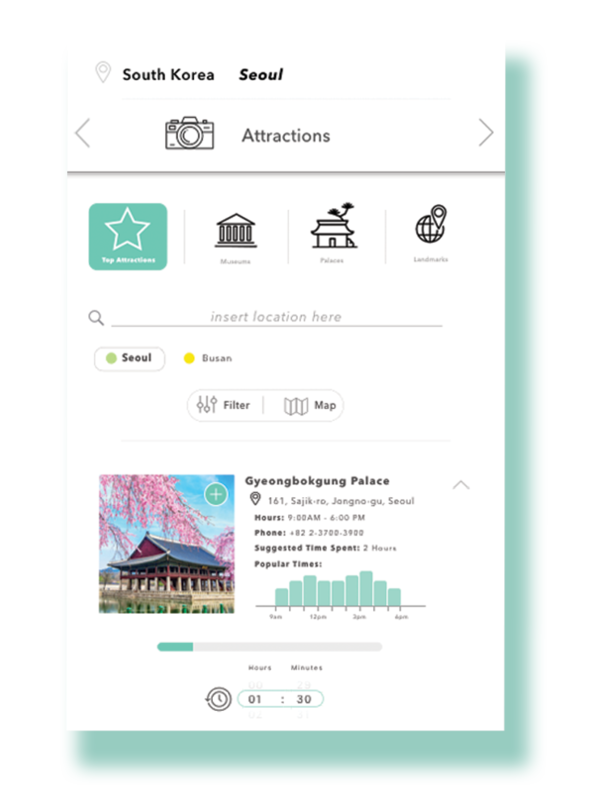 ​ A creative collaboration with Vogel Nest cofounder Shannon Vogel, we decided to design a potential app that would utilize the time you have traveling in an easy to use manner. This is a side project with the goal to create an app that enhances your travel experience with effective time-management tools. After studying abroad in Italy in fall 2012, I developed a passion for traveling. During that time, I didn't own a smart phone and traveled the "old fashioned" way, which meant using a map and asking people when I was lost...which happened a lot. But luckily, technology has advanced in recent years - we have smart phones and applications to help make traveling easier. But even with all these apps, there still hasn't been a way to save travel time. ​It wasn't until I traveled to South Korea in 2015 that I realized it would have been a useful tool in a foreign country where English wasn't the native language and asking for directions isn't always an option. I've used many different types of travel apps: TripAdvisor, Hopper, Google Trips, Skyscanner, and Hostel World. Shannon and I decided to download the top travel apps from the Google Play store. We read through comments and suggestions on each app, taking note of what worked, what didn't and what we could improve upon. During our research, we came across several issues experienced by most travelers (including ourselves) and how this affected travel time. Having traveled to 15 different countries, I used various forms of transportation. This made me confident to travel within any country, but South Korea was the first time where I had encountered several unexpected issues. Shannon and I took our knowledge of travel and sought out what other travelers might be concerend with as well that could enhance our apps features. After talking to other travelers, we narrowed down the main problems they faced, what apps they downloaded and if they found any time saving features in those apps Using this information, we created a sitemap and some sketches for the structure of the app. After extensive research and interviews, we came to the conclusion that in order to save time on your travels you need to know what you are going to do ahead of time, estimate the amount of time you are going to spend there and then calculate transportation times within each location. Keeping this in mind, we created a structure of the app that allows people to input this information with as little stress as possible. Traveling can be an overwhelming task and our main goal was to save travel time, while also making it easy for people to use. Our main design goal was to keep it simple, clean and clear for users. The first step is to input the dates of when you will be arriving to your location. Inputting the date is an important step because traveling on certain days of the week can affect what you do. While we traveled in South Korea we didn't anticipate that we would be visiting during the holiday Chuseok. As a result, palaces and other places we wanted to see were either filled with crowds or closed due to the holiday. In order to avoid this problem, we want our app to inform the user of the days they can and can't do something. This would allow the user to be mindful of what they can do during that day and save time on other things that are important in their schedule. After inputting the dates, the next step is deciding what you will be doing during your travels! ​We decided to add where you will be staying as the second step to our process because we noticed while interviewing and using other travel apps that most apps didn't input where you were staying, and instead focused on what you were doing throughout the day. From experience, we felt that where you are staying will affect how you schedule your day and how you will manage your time. There were times we had a hostel that was 30 minutes outside of the city we wanted to explore, which affected when we would start/end our day. With that issue in mind, we created the feature of inputting your lodging location - so once everything is calculated, it will always start and end your day at that location. It will factor in how long it will take you to get there and back. 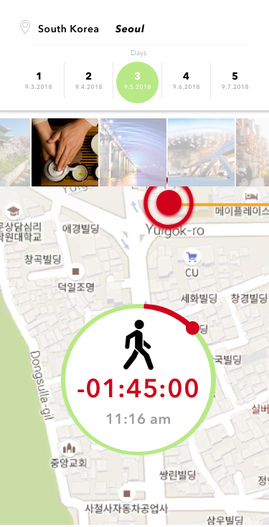 For the next step, you will input what you plan on doing throughout your trip. Attractions are broken up into top attractions, landmarks, museums, as well as many other categories to fit that location. ​However, if you are looking for a specific area or activity to do, you can easily write it into the search bar and start adding it into your travel planner. In this step you will start to customize your trip in a timely manner. Every time you pick a location it will have a suggested time that most people spend at that particular location. 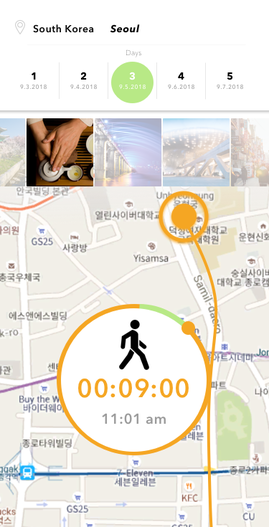 If you feel that you want to change the amount of time at that location, you can easily customize it in the settings. This feature is a vital key in estimating the time throughout your trip. This saves travel time because the user will be able to craft the amount of time they want to spend, and not wasting it in other locations. While planning their trips, we found some people preferred visually seeing where the locations were on a map like Google Maps instead of scrolling through a list to find what they want. We also noticed that numerous younger travelers preferred to walk everywhere and wanted to avoid mass transit if possible. So, we took this into account and made sure that this feature would be incorporated in the app. On every main page of a section, Lodging, Attractions, and Food, you can filter the settings or you can use the map setting. This brings you to the map and has similar functions to Google Maps where the locations will "pop up" depending on what you choose and where your locations are. 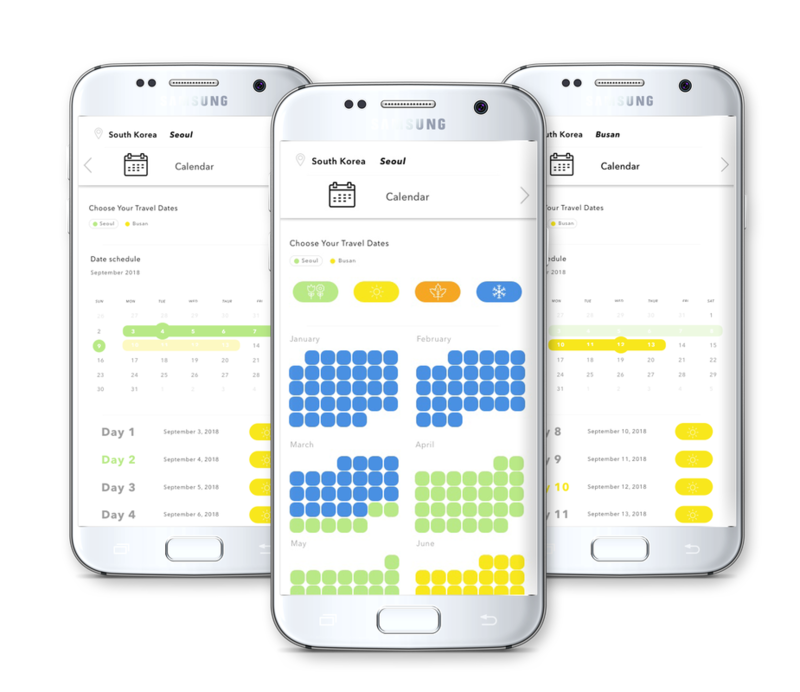 Now that you have selected when you are going, where you will be staying, what you will be doing and eating, the app will collect all of this information and put it into a easy-to-use planner where you can craft each day to your liking. The main issue most travelers face is having a long list of things to do and places to see, but not knowing if they have enough time to fit everything in. We designed this planner to help travelers save time by visually showing how much time they will be spending throughout that day. 1. Transportation: We wanted the user to be able to pick their mode of transportation. During our conversations with travelers, we found there are many different types of travel preferences. These differences all impact travel time. ​We wanted to let the user pick their mode of transportation, so when everything gets calculated it can show them the quickest way to get there. 2. Start to End: The user will then input the time they plan to wake up/start their day and the time they will end it. This is where the timer begins! For this example, I set the start of my day for 9am and the end for 9pm. The timer calculated that I have a total of 12 hours for that day. 3. 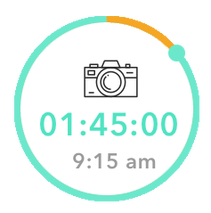 Timer: The day will always start with your lodging and from there, the app will calculate how many hours you will have remaining for that day. 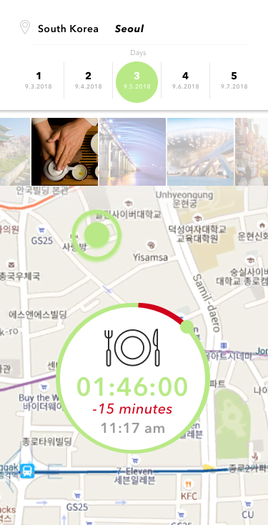 ​As you select what you want to do, the app will calculate the times for the day. As it calculates, it will automatically put in the mode of transportation that is fastest between routes. Once you place all the information into the day planner, this is what the final result will look like. You will be able to select through the days and re-arrange it the way you want. The camera icon indicates the topic. Underneath the icon is the amount of time spent (Hours: minutes: seconds). The last row is the time of day. 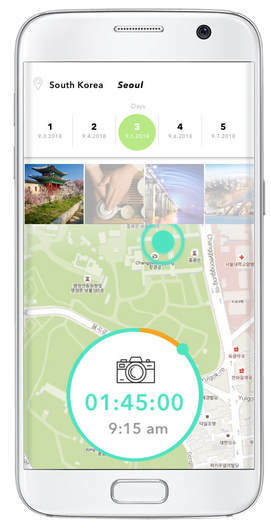 This feature is designed to make it easy for users to see how much time they have at a particular place in order to complete the rest of their itinerary during the day. The user is stopped by a vendor, or sees something that makes them stop, which delays their time to their next location. The user is informed that they have 15 minutes less than they intended if they want to continue on schedule. If the user doesn't use all the time selected, time is added onto the rest of the day.